Note, this type of article will be available exclusively to subscribers starting in January, 2019. Join us in December and become a Charter Member … and receive the Trial Rate for a full year. The most you’ll ever pay is $0.33/day. The northbound bus priority lane is now open from Tolmie Avenue to the Burnside Bridges, saving commuters at least 10 minutes from Fisgard Street to Tillicum Road during peak travel times. a recently completed study for bus priority lanes and better transit infrastructure along the Island Highway in Colwood and View Royal. The fine for illegal use of a priority bus lane is $109. Police will continue to carry out enforcement and monitoring of the corridor to ensure compliance. In peak travel times, 1,700 vehicles per hour move along Douglas Street. 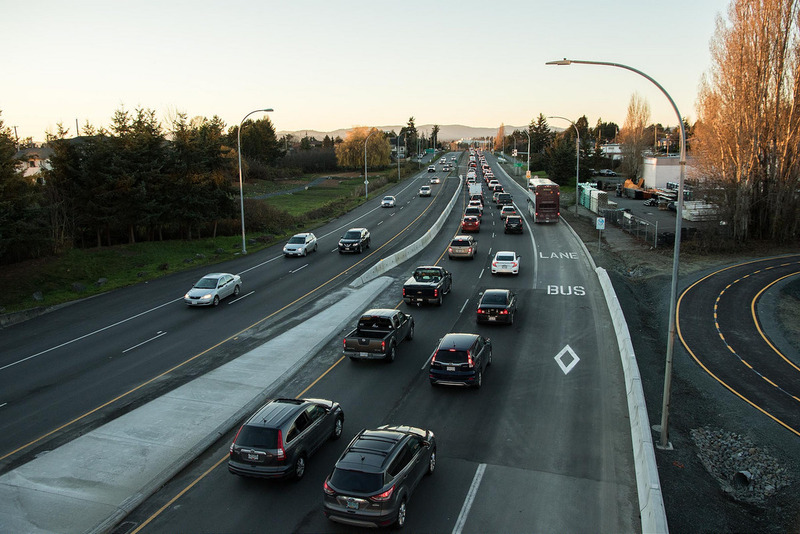 Funding for the northbound bus priority lane from Tolmie to the Burnside Bridges was jointly funded by the governments of Canada and British Columbia through the Public Transit Infrastructure Fund (PTIF). PTIF was announced in 2016 and helps support new capital projects in BC Transit-served communities throughout the province. Follow the work of the Ministry of Transportation and Infrastructure online. For more information on bus priority lanes and the Victoria Transit Future Plan, visit this website.